Today is the release day of Lauren DeStefano's new book and first in the Chemical Garden trilogy, Wither ! Rhine lives in a world that is slowly decaying. Thanks to leaps in science and technology, scientists managed to create one perfect human generation, with an extraordinary flaw: their male offspring only live to age twenty-five, and females to age twenty. At sixteen, Rhine and her brother have managed to create a decent life for themselves, until the unthinkable happens. Rhine is kidnapped at the order of a wealthy man, and forced to marry him, along with two other girls. On the surface, their new lives are beautiful, glamorous. They have everything they want within the confines of their husband's estate. But when Rhine befriends a servant, Gabriel, and begins to dig deeper into the hidden activities of the household, what she finds terrifies her, and escape becomes paramount. 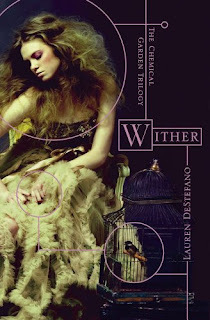 Wither is an exceptional novel that begins with a bang and doesn't let you go--it's gut-wrenching, shocking, incredible, and completely and utterly absorbing all at once. Rhine's plight will certainly elicit sympathy, and DeStefano keeps the reader on edge the entire time as she constructs Rhine's mysterious, opulent, and dangerous world. Polygamy and the lives of sister wives is a mainly uncharted area in YA fiction, but DeStefano not only makes it fascinating, but heartfelt and relatable as Rhine and her sister wives live, work, and argue, sometimes against each other, and sometimes united, trying to make sense of their lives and purpose. Rhine has the maturity of one that has had to grow up too quickly, and it makes her an insightful and absorbing narrator. She is a fighter, and despite knowing that her days are numbered, she's determined to do the only thing she can do--live on her own terms. But her determination doesn't make her mission easy--she still struggles with guilt and compassion for those that would hold her back. Rhine's journey and her gradual unveiling of her life prior to her kidnapping will caution readers against the dangers of the pursuit of perfection, remind them of the frailty of humanity, and emphasize the importance of perseverance, faith, freedom, and of course, love. DeStefano is a fearless writer, and though it is firmly its own book, Wither will remind readers of Margaret Atwood’s The Handmaid’s Tale . Cover Comments: This cover is beautiful--so perfect! The model captures the glamour and beauty of Rhine's new life, but the caged bird also expressed how trapped she really is. I also really like the title treatment--modern, and sophisticated, but yet it blends with the cover image very well. I keep reading reviews of this book and I can't wait to get the chance to buy it for myself. Being based in the UK we have to wait until the summer before it hits our shelves. One of my favorite parts of the book, as you mentioned, was the relationship between the sister wives. I found it absolutely fascinating and very well done. Great review! Great review. I've heard other really good ones. I'll have to read it.